Last Sunday was my first time in the ring since my fight in May last year. It was a long time coming after fights in October and March, and another interclub in May this year fell through, so it was good to be back. The show started at 11.30 and my fight was at 3 so it was a very long time to wait. They changed it from 5 rounds to 3 but it was still quite long enough. We both do MMA and grappling (he had 4 MMA fights) so there was a lot of clinching and kicking involved. With the adrenaline involved as well it was absolutely exhausting. There’s various things I picked up from it that I need to work on, but that’s part of the point. I’d say he probably had the edge over me this time. As far as terminology goes, someone complained when I described an earlier interclub as a fight, but this time the organizer described them as fights so that’s good enough for me. At this one they had a professional photographer so I got loads of photos, which are on Flickr at http://www.flickr.com/photos/mhoulden/sets/72157624271646904/. Some of my favourites behind the cut (on LJ). What surprised me is just how aggressive I look in them. Obviously this is full contact martial arts and I’ve seen other people pulling similar faces, but it’s very different when it’s you. I’m back, I survived and I’m absolutely shattered. More photos to come later, but that’s all for now. Looks like I’ve been matched, so I should be doing a Thai interclub on Sunday. It’s the first time in over a year I’ve been in the ring, the last time being my fight on the 30th of May last year. There’s no decision with interclubs so there’s no win or lose, but there’s still the pressure of being in a boxing ring with someone you don’t know and a referee, and loads of people watching. My last interclub was on my mum’s birthday and I presented her with a nice box of chocolates and a black eye. This one’s 5 x 1 minute rounds with controlled contact, but punches, kicks, knees and clinching (but no elbows) will be allowed. I will be wearing shin pads and 16 oz gloves but I’m not sure if I’ll also have to wear a chest pad and head guard. Given a choice, I’d prefer not to. All I’ve done in the past has been over three rounds of a minute and a half so allowing for a short break between each one it’s almost twice as long as what I’ve done before. The same place organizing this interclub has a show on the 24th of July and I’m hoping that if I put a good show on on Sunday then they’ll find a place for me on it. I’m about 89 – 90 kg for this interclub but I’d be fighting properly at 86 kg. After training with a few kick boxers I’ve got to say I’m very definitely a Thai boxer. One of the biggest differences (apart from the addition of clinching and knees) is that kick boxers step in, do something and then step out again whereas Thai boxers keep moving forwards and don’t tend to duck and weave the way boxers do. 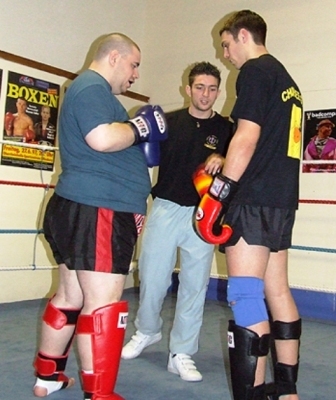 Just for old time’s sake, here’s the opening bit of my first ever interclub in Feb 2007. 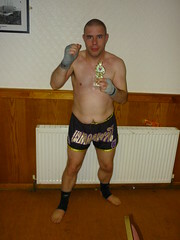 At this one I weighed in at 127 kg. How long ago that feels now. I will of course be taking a camera and be putting the best shots up here. Wish me luck.